This is one of our most popular courses, which is designed to introduce participants to the sport of sea kayaking. The program explores the fundamentals of ocean paddling for the first time kayaker or those who have done some paddling, but have not had formal instruction. 7 hour course: 9:00 a.m. – 4:00 p.m. Cost: $160.00 / person plus 5% GST: includes kayak, equipment & wetsuit. Please note all instructional programs will take place off the main beach in White Rock unless wind and tide result in a change of location. Participants will be informed in advance of any changes due to environmental conditions. Please contact us at (604) 535-7985 or email nwcakayak@xplornet.com. **For all Kayak Courses NWCA requires a Visa or Master Card deposit. This course is an introduction to sea kayaking for paddlers who are new to the sport or getting started. It is a great program for those looking to explore our local waterways and coastlines with friends, or in guided day or overnight paddle scenario. This program will cover the components offered in our Introduction and capsize course in two separate session and breaks up the material so it can be taught over two days. Participants will be introduced to all the necessary kayak and safety equipment. In addition they will be taught the strokes needed to control their boat and learn the important steps in managing a capsized kayak. After mastering the wet exit students will learn how to efficiently get back into your boat with the help of a partner. Upon successful completion of this program participants will receive a Paddle Canada Introduction to Kayaking Skills certification. Book with an existing group or find some friends. Kayak courses may be arranged outside our listed programs for groups of 4 or more. Cost: $265.00 / person plus 5% GST: includes kayak, equipment & wetsuit. This 4-hour course covers solo and assisted capsize recovery procedures. The program is designed to build confidence and safety awareness through and understanding of kayak re-entry. 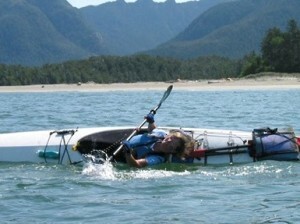 The capsize course provides participants with an understanding of the necessary safety gear when paddling and techniques used to support a capsized person. Everyone on the water should have the skills to assist himself or herself or another paddler should a mishap arise. 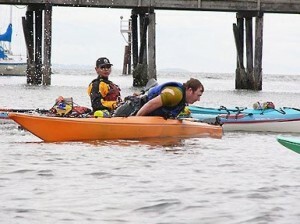 ** NWCA requires capsize experience for non-guided kayak rental. Book these courses with an existing group or form your own should you require an alternate date. Recommended Prerequisite – Introduction Course, CRCA Introduction Course or some paddling experience. Cost: $115.00 / person plus 5% GST: includes kayak, equipment & wetsuit. This four-hour course is designed for paddlers who have basic experience and seek to expand their kayaking capabilities. The course is great for those interested in developing skills for rolling. The program will focus on high and low bracing, edging, leaning, hip flicks, sculling and various draw strokes. The kayaking skills taught in this course will help the participant gain an understanding of kayaking maneuverability and stability using body and paddle position. Book with an existing group or find some friends. Recommended Prerequisite – Introduction to Sea Kayak Course and or previous capsize experience recommended. Under the guidance of an instructor, explore the technique necessary for successful and consistent rolling. Kayak rolling is taught using a one on one approach, which is beneficial for the first time roller to those interested in enhancing their roll. Participants should have a thorough understanding of intermediate strokes and capsize procedures. Cost: $40.00 / person 5% GST (ocean session): Equipment and equipment rental is extra (see rental schedule). For those who do not have time to fit into our course schedule or want more personal attention to hone their skills private instruction is available at a rate of $35.00 per hour plus any applicable taxes. Bring a friend for another $20.00 per hour for each additional person and split the cost. Kayak and equipment rental is extra. (Please see rental schedule). Keep those kayaking skills in tact Season to Season. A refresher course is a great way to hone one’s skills after a period of inactivity. 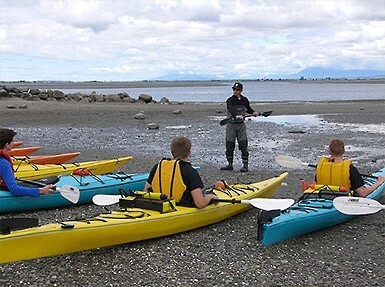 This program is modeled after our popular “Introduction to Sea Kayak course”. Cost: $145.00 plus 5% GST (participants must be on NWCA database and completed an Intro Course with NWCA over the past 24 months to qualify.) – see schedule above. Our kayaking for kids program is designed for youth age 10 – 15 years old who are interested to learn kayaking. The program covers gear and equipment, kayak safety procedures and basic paddling technique. 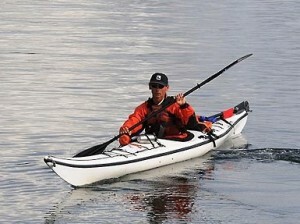 Participants must be able to carry a full size sea kayak with the assistance of other paddlers. Cost: $140.00 plus 5% GST. Please note all instructional programs will take place off the main beach in White Rock unless wind and tide result in a change of location. Participants will be informed in advance of any changes due to environmental conditions.